It was familiar, it was local and it was hiding a family secret. Not only had I lived near Western Illinois University my whole life, but I earned both my bachelor’s and master’s degrees from the institution. I had visited the Leslie Malpass Library numerous times. Teachers do LOVE homework and especially homework with research. Research leads to libraries. Libraries HIDE archives….well, not literally, but most people don’t think to check them out. The Illinois Regional Archives Depository, better known as IRAD, is located on seven different state university campuses in Illinois. (Yes, we did get this thing right as well as claiming Abraham Lincoln.) IRADs hold archival documents for the state, which include birth, marriage and death records, county board proceedings, land deeds, mortgages and tax sales as well as probate records. Probate records – right there under my nose – on the sixth floor of the building where I was researching the impact of recreation facilities on students in higher education. Secrets are always kept in the attic. Every child knows if you want to find Grandma’s good stuff, go to the attic. 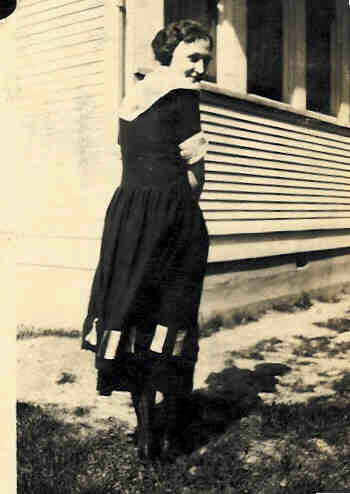 You’ll find her flapper dress from the 1920’s or flower power child picture of her from the 1960’s. You’ll find your parents report cards, 4-H records and school yearbooks in attics. Your mom’s favorite doll, your dad’s favorite toy car and baseball glove in the attic. The items that tell our family stories are stored in attics…or on the sixth floor of the Western Illinois University library in IRAD! By chance, I went to the IRAD and was interested in the Peoria County, Illinois records they had. I was actually looking for information on my 2nd great grandfather and grandmother, August and Theresa Yess, but what happened “leafed out” the branch of our family tree instead. My maternal grandmother’s family were English (Harrison) and German (Schmitt). The Harrisons were prolific collectors of family history. Must be something English. The Schmitts or Shmitts or Smiths only had a little information. We knew they had come to Peoria, IL from Germany. We knew their names were Johann Bernard Schmitt and Veronika “Sophronia” Bootz and we knew they would later own ground in Jubilee Township, Peoria County, Illinois. We knew their children’s names. There was little more than that to fill out the branches. This is where the “attic” on the sixth floor of Leslie Malpass Library came into play. I asked in IRAD if they had any records for the name Bootz or Schmitt or Shmitt. (The last had to be a made-up spelling as that is not a combination of letters in German that are used – the “h” and “m” together.) Suddenly the lady returned with a legal-sized folder full of papers – probate records. This is the gold mine I found. 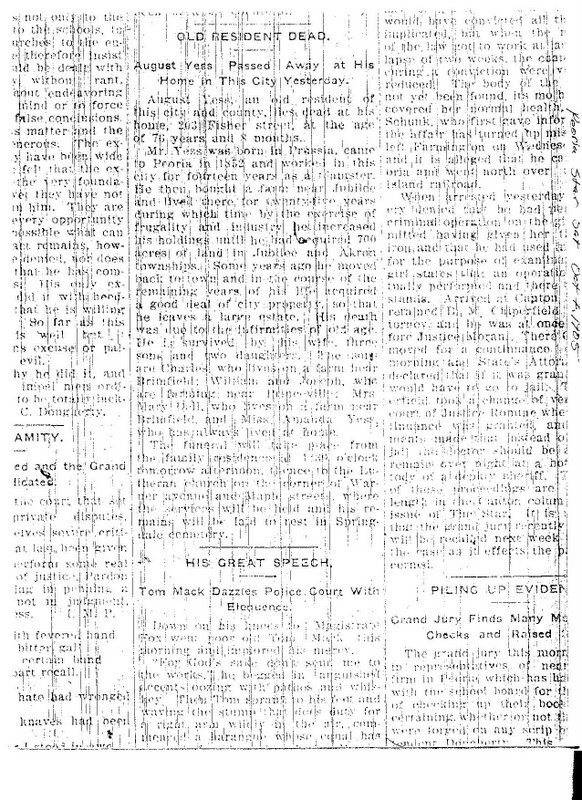 WILL OF JOHN B. SCHMITT In the name of God, Amen, I John B. Schmitt of the Town of Jubilee in the County of Peoria and State of Illinois of the age of 56 years and being of sound mind and memory do make publish and declare this my last Will and Testament in the manner following that in to say: FIRST: I give and bequeath to my wife, Veronica Schmitt all my possessions, both real and personal of what kind so ever together with all the appurtenances thereunto belonging to have and to hold for use and benefit during the term of her Natural life Time. SECOND: At the Death of my wife, Veronica Schmitt, I give and Bequeath to my Son, William Wallace Schmitt all the piece or parcals of Lands as followes – the North West quarter of Section Eleven together with the West half of South West quarter of Section Eleven all in Township Ten North Six East of the fourth principle Merridian. Together with all the hereditaments ad appurtenances thereunto belonging to have and to hold the premises above described to the said William Wallace Schmitt his Heirs and assigns forever. THIRD: At the death of my wife, Veronica Schmitt, I give an Bequeath to my son, George Schmitt, all pieces or pracals of Lands as followes – the North East quarter of Section Eleven and the East Half of South West quarter of Section Eleven to hold the premises above described with all the hereditaments and impertinences thereunto belonging to him the said, George Schmitt, his heirs and assignees forever. And I further provide that should theire be any back payments or incumberance on the North West quarter of Section Eleven at the death of my wife, Veronica Schmitt, my son, George Schmitt, shall assign and pay one half of said indebtedness or should the title to the North West quarter of Section Eleven not be secured then the North East Quarter of Section Eleven and North West quarter of Section Eleven to be equally divided between my two sons, William Wallace Schmitt and George Schmitt to be held to them their heirs and assignees forever. FOURTH: At the death of my wife, Veronica, Schmitt, I give and bequeath to my daughter, Lizzie Schmitt Feaser, and her husband Wm. Feaser that piece or parcel of Land described as followes – the West half of the North West quarter of Section Twenty Six in Township Eleven North Six East of the fourth princaple merridian together with all the hereditaments and impertinences thereunto belonging to have and to hold for them and theire use during the term of their naturel life time and at the death of Lizzie Schmitt Feaser and her husband William Feaser to be equally divided among their Children of the said, Lizzie Schmitt Feaser share and share alike if an are living. Should there be none living at the time of their death when it shall be Equally divided between my Two Sons, William Wallace Schmitt and George Schmitt, to be held to them their heirs and assignees forever. And further that any personal property belonging to my Eastate at the death of my wife Veronica Schmitt it shall be equally devided between my Two sons, Wiliam Wallace Schmitt and George Schmitt, AND: Lastly, I hereby appoint my wife, Veronica Schmitt to be Executrix of this my last Will an Testament without Bonds. She to approve and pay all Lawfull debts owed by me at the time of my deceace and hereby revocking all former wills made by me. The probate records also listed all his worldly possessions down to how many down feather ticks for the beds they owned. The value of cattle and how many bushels of oats were also listed in the will and probate records. There it was! Buried in a library at the University I attended and work at. Next time your mother suggests you study at the library, better take her up on it. You might find your relatives there. Diverse, divergent, but yet they were both my 2nd great grandfathers. They were hard workers, had left their mark on their communities, their families and the plat books of their counties. August Yess was born the 29th of January, 1829 in Baden-Wurttemberg, Germany. He immigrated to the United States in the 1850s. I have yet to uncover any documentation telling why…why would you leave your family in Germany to move to Peoria county, IL? A fellow genealogist gave me some clues. Maybe he wasn’t the oldest child and was looking at a lifetime of military service. Maybe he had little chance of inheriting any land to live on. Maybe he was a young 23 year old man who was excited about the prospects of what life could offer him in the United States. Whatever the answer is or was, he came with few worldly goods. 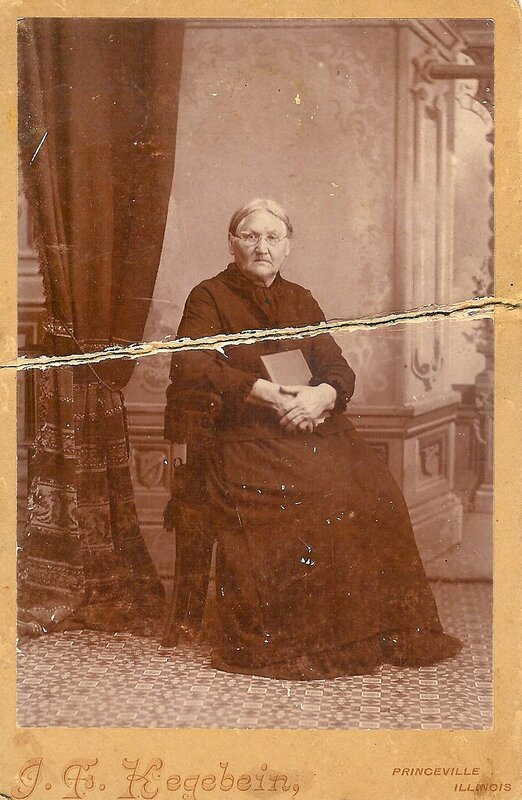 He married a fellow immigrant, Theresa Hanlach in Peoria County in 1855. They would have Charles, William, Mary, Amanda, Joseph and John Yess. 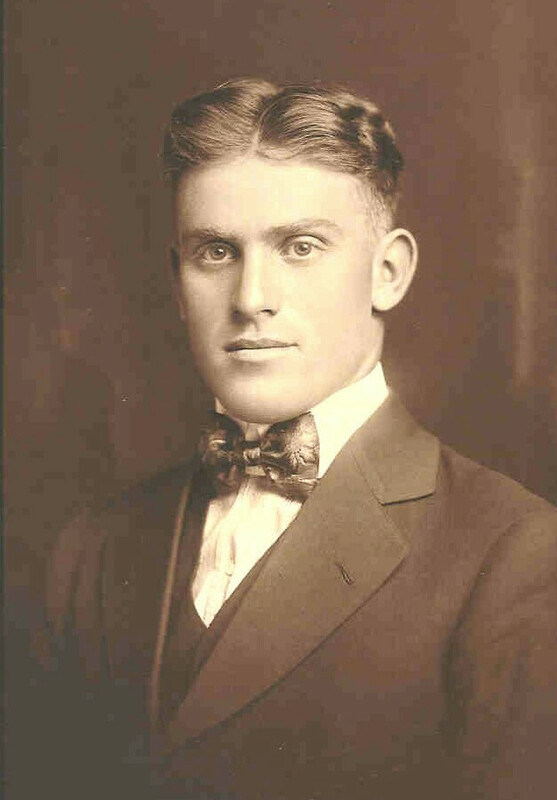 John, my great grandfather, died before his father. August passed away at age 76. He and Theresa had acquired a lot of land in Peoria county. His name was all over the plat book in Jubilee township. He had left Germany and in little more than 50 years, had prospered to the point of leaving a substantial estate behind for his family. 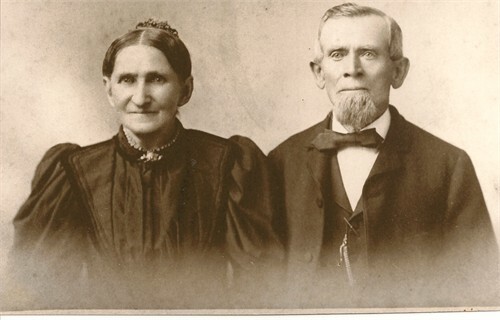 By contrast, one of my other 2nd great grandfathers, Elias Chenoweth, was born in Washington County, Indiana 21 June 1835. The Chenoweth family had already been in the United States for 125 years by the time Elias was born. In fact, the Chenoweth family was in the United States BEFORE they were the United States! October 30, 1856 he married Permelia Ellis in Fulton County, Illinois. Her family had been in the American Colonies before 1606. Elias and Permelia were the parents to Mary, Emma, James, Adaline, Martha Jane, William Harrison and Elias Milton.Two of their children would die before Elias. While Elias had moved to Fulton County, Illinois with his parents and five of seven siblings. (Two died prior to moving to Illinois.) Elias would live in the home his father had built near Bernadotte, Illinois, on the farm his father had purchased, but he prospered of his own toil. I discovered how ambitious he was from his papers. My grandparents and parents are excellent archivists and had saved old checks, deeds, and financial papers throughout the years. Looking at checks dating back to the late 1880’s and early 1900’s as well as reading deeds and loan papers, I figured out he often loaned money to neighbors so they could pay their real estate taxes. Copies of papers signed by those individuals as well as copies of the deeds were buried in the family archives. As an interesting aside, I once found a paper regarding a loan he had filed with the County Clerk in Fulton County, Illinois . Imagine my surprise when I found these details on the legal paper. 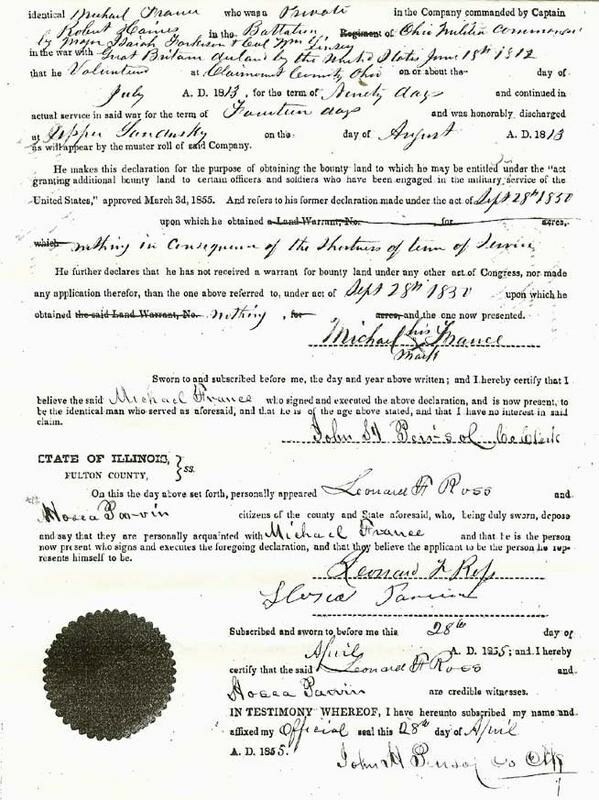 Certificate of Redemption to Elias Chenoweth for 35 acres in Fulton County, Illinois for the sum of $15.08 plus .25 cents for the copy of the certificate. The certificate is signed on March 24, 1911 by Clerk of the County Court, Austin Onion and the fee had been paid in June of 1910. The interesting twist is my sister is married to a gentleman named Onion and they have a son named, Austin. So, my 2nd great grandfather had been issued a certificate by a gentleman who’s relative would marry Elias Chenoweth’s great-great granddaughter! Small world, eh? Both 2nd great grandfathers prospered but in different ways. Both had large families and invested wisely so they owned significant land later. However, one was a first generation immigrant and the other was a multi-generation Patriot. The Egyptians put great emphasis on keeping the names of their pharaohs maintained on their tombs, in halls and records. They believed their pharaohs were immortal as long as their names remained for everyone to see. Genealogy is not unlike that belief. In maintaining records and family trees, we believe we can give some measure of immortality to our ancestors. My parents were children of the late 1930’s; my grandparents were born in the late 1890’s and early 1900’s. I was fortunate enough to personally know all my grandparents. I was even more lucky to hear the stories they told of their parents and grandparents. And with that set of memories, I easily move back to the 1830’s – almost 185 years in the past. 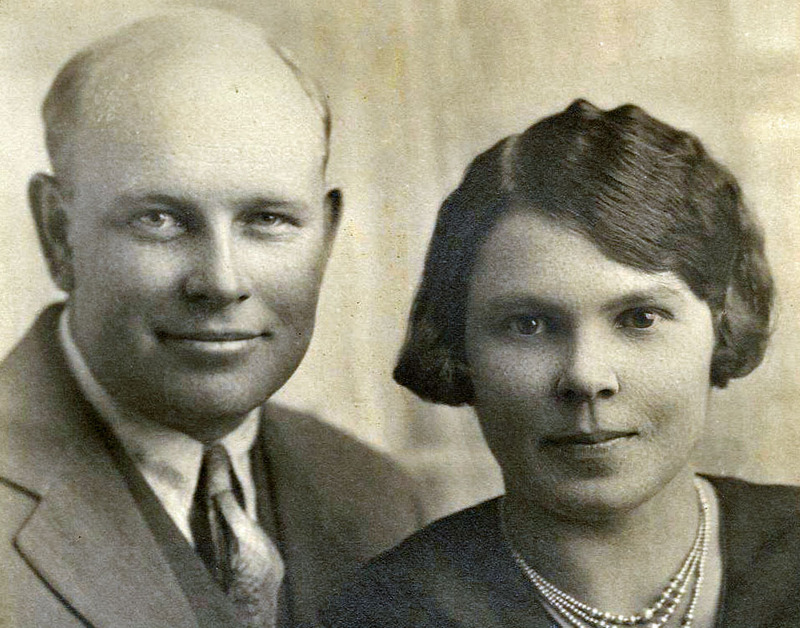 The picture above is of my paternal grandparents, Elzie Chenoweth (1897-1986) and Vera France Chenoweth (1902 – 1995). Both lived long prosperous lives and saw their great grandchildren born. With the blessing of videotape, I can still see them and hear them whenever I want. Grandma Vera was a daily diary writer and I still love to pick them up and read what she had recorded each day. I hear her voice reading it when I see her handwriting. She lives on through her writing. I hope to do that someday also. These pictures are of my maternal grandparents Jessie Smith Yess and John Yess. These youthful pictures of them remind me they once were young and just beginning their lives. My grandmother had been a schoolteacher and quite frequently wrote down quotes or poems she liked. We still have many letters and poems Grandma Jessie wrote. The obituary at the left is of the man pictured on the right. August Yess is my 2nd great grandfather and a German immigrant. He became prosperous after immigrating to the United States and owned a lot of land in Peoria County, Illinois. The picture of August and Theresa Yess, as well as the obituary of August Yess, gives immortality to them also. Immortality as defined by Websters dictionary, means “unending life”. Pictures, stories, documents catalogued bring unending life to our ancestors and thus immortality. 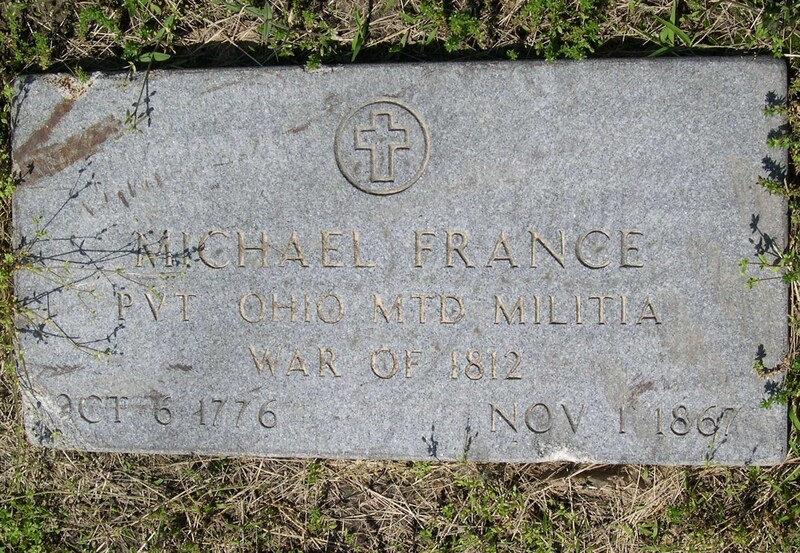 It’s vital to honor our friends, relatives and ancestors by recording their names with photos. We honor them when we repeat their names, when we tell their stories, when we remember them. They live long. 52 Ancestors Challenge – How Do You Spell That? German is NOT an easy language! Any language that would take the simple word of paratrooper and turn it into “fallschirmjager” is not an easy language to read or speak! In 1981, I traded off my Cornish-sounding last name of “Chenoweth” – which means “new house” (Chy noweth) for the German grounded “Terstriep” Yes, that’s right…TER STR IEP…No, Not EIP, but IEP….Once again, TER ST RI EP. It’s not an easy name to spell. 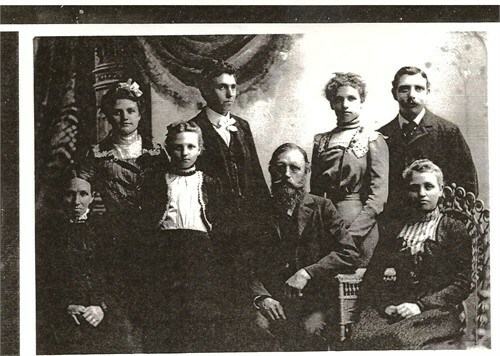 Herman Terstriep family prior to Christina Tenk Terstriep’s death in 1909. My husband’s 2nd great grandfather was Herman Terstriep. Herman’s father is listed in baptism records in Germany as either Johann Bernard Terstriep OR Johann Bernard Striepert. The alternative name shows up in other records dating back into the 1700s. The family story has always been that “Terstriep” is not actually the correct spelling of the name, but a schoolteacher a few centuries back changed the spelling. Really a schoolteacher? Of all occupations, one would assume the schoolteacher would spell the name correctly. While I can’t corraborate that story, I can tell you the name has been misspelled and mispronounced by friends, teachers, clergy, neighbors and officials ever since. “Tur-strip”, “Tier-strip”, “Tur-stripe” and a few other derogatory versions have been cooked up over the years. Even my smartphone pronounces it differently – “Tur – STREEP”….ugh! Western Germany is where my husband’s family came from. Dating back well into the 1700s, there has always been a “Terstriep” in the parish records at Sankt Marien Roemisch-Katholische church in Alstaette, Ahaus, Westfalen, Prussia. It appears the spelling error was in vogue for a few years, but the rightful spelling was reinstated some time later. So, once again, I went looking for clues as to how the name Terstriep came to exist. If ‘Ter-‘ was to be paired with some other word to denote ‘at, in or to’ what was the other word? That I’d have to ponder. In previous blogs, I’ve referred to the fact I often “talk” to my ancestors. While I don’t actually verbalize out loud to them , I internally talk to them. I’ve asked them to help me find their gravestones, to tell me their stories and in this case, I’ve asked my husband’s ancestors to help me find the “Striep” in Terstriep. While checking out what our German cousins were doing on a particular weekend (yes, there are still Terstrieps in Alstaate, Ahaus, Germany), I found one of them was visiting an island in the Netherlands. Being the snoopy person I am, I looked the island up on the map. Quaint, small, and honestly I didn’t realize there was this chain of islands off the coast of the Netherlands. They looked beautiful. In some places, you are only allowed to ride bikes for transportation! Who knew? As I scanned the map of the Terschelling Island, I found a very, very small town called (you guessed it) Striep. Somewhere in my investigation, I found this means “ditch”. “Ditch” in Dutch. Literally, the name Terstriep must mean “at, on, or to the ditch”. The ditch? That’s it? Misspelled, mispronounced and misunderstood and it just means “At the ditch”? In 1867, Herman Terstriep (shown above) and his wife, Christina Tenk Terstriep, immigrated to the United States through New Orleans, LA. They most likely took a steamship up the Mississippi River to Quincy, Illinois to join many other German immigrants from nearby Munsterland. Every Terstriep in the United States, and there isn’t a great deal of us, can be traced back to Herman.